As an example of how philatelic and historical research is closely related, Ian Nutley describes the results of his researches into the mail connected with Auschwitz and the Holocaust. 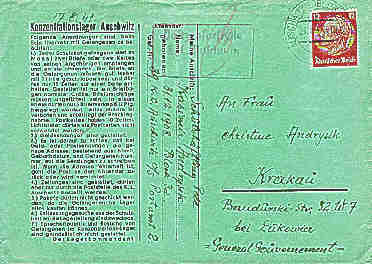 ... this cover from Auschwitz was written by Kasimir Andrysik, "a Polish political prisoner who was in the very first batch of prisoners taken to the camp..."
From THE ECHOES OF THEIR VOICES, By Ian Nutley - hosted by The National Philatelic Society, U.K.
By: Dr. Chaya Ostrower, Ph.D. - Thesis topic: "Humor as a Defense Mechanism in the Holocaust". Tel-Aviv University. See Also: Clubs : Topical Index : War. "..a thematic stamp collecting group that collects and studies postage stamps related to archaeology (and cultural anthropology for spice) from the stone age to the beginnings of recorded history." "Do you enjoy reading about ancient and classic cultures like the Egyptians, Greeks, Romans or the 'more than classic' Ice Age populated by Neanderthals or Cro-magnon men? Love learning about more modern cultures like the Olmec or Han? Mysterious places like Easter Island or Angkor Wat? How about prehistoric cave art, lost civilizations or mythology?" Featuring "Australian stamps for Antarctic Territory"
Stamps issued for the use of members of official exploration expeditions are called 'Expedition Stamps'. Depicting fires and Fire Service. "Send for my list or send your wants list..."
"Interests: First Day Covers: Primarily North Carolina FDOI & related UO's, U.S. Fire Service related Issues." Starting with the 1983 Babe Ruth stamp… produces Whitecraft Cachets, I remember some interesting FDC's he had.. I even have one - aj. Specialty: First Day Covers of North Carolina and Fire Service issues and a few baseball issues.